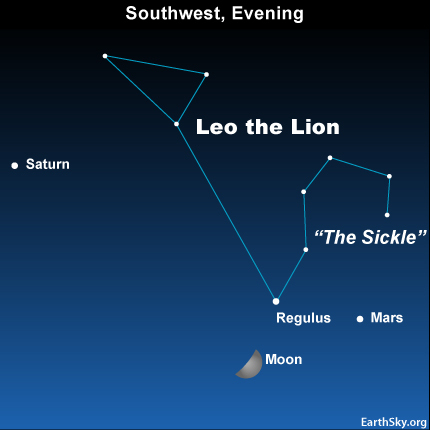 In the west-southwest this evening, the first-quarter moon  hangs below the “Sickle” of the constellation Leo the Lion, and its brightest star, Regulus . Note that the “Sickle” looks like a backward question mark. If you hold your outstretched fist to the right of the moon, it will span the distance to a ruddy “star” – but that’s no star, it’s the planet Mars. Ever since the end of January – when Mars and Earth were closest to each other – our planet has been pulling away from the Red Planet in our planet’s faster orbit around the Sun. Curiously, if you were a skywatcher on Mars tonight and you turned a small telescope back toward our Blue Planet, you’d see Earth at a half-lit phase like the moon. Back on Earth, however, Mars appears as a tiny gibbous  (90% illuminated) through a telescope. As seen from Earth, Mars always exhibits a full or nearly-full phase. Make note of this location in the sky. Night to night Mars and the constellation Leo will edge nearer to the horizon while the moon will move east of Leo, becoming a gibbous of its own on its way to becoming full next week. Continue to watch Mars as it closes in on Regulus. They’ll pair up in two weeks, just a pinkie-width apart.